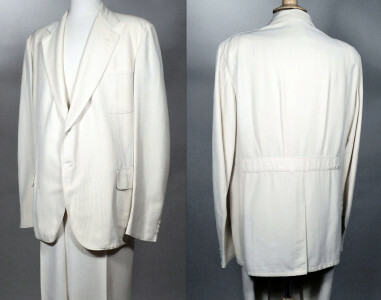 1930's vintage PALM BEACH, GOODALL belted back button-fly suit. Ivory genuine Goodall Palm Beach cloth. Two button jacket with 1/2 belt back. Wide notched lapels. Rounded patch pocket at chest. Two rounded patch pockets with flaps lower. Deep vent center back. Rayon 1/2 lining. Shell buttons. Flat front trousers. Button-fly with vegetable ivory buttons. Ticket pocket below right waist. Side seam pockets. Welt hip pockets, button at right. Suspender buttons. IT'S A SIZE 52 PALM BEACH!! Sleeves, measured from seam to cuff edge - 28 1/2"
Width at edge - 10 1/2"
Very good condition. Jacket shows very slight shadow water marks at lapels, hem line mark where cuffs were let down and a few random small faint soil marks. Trousers show light soil marks below waist (see photos), hem line soil mark where cuffs were let down and a few random faint soil marks. Suit might benefit from a good soak since it is washable.